Thallus pinkish-red, complanate, to about 10 cm tall, axes up to four times alternately pinnately branched; main axes up to 5 mm wide, compressed, tapering towards apices, which bear monosiphonous pseudolaterals except older branches where these have been shed; main axes basally corticated, rather rigid, becoming delicate near apices, structure of central cell surrounded by 4 periaxial cells (5th periaxial cell absent or reduced), layer of subcortical cells and cortex of rhizoidal filaments; each axial segment bearing two laterals (one uncorticated monosiphonous pseudolateral and one determinate sympodial lateral) arranged in alternating distichous pairs. Tetrasporangia in stichidia that replace determinate sympodial laterals, borne on short polysiphonous corticated pedicels, lanceolate to sickle-shaped, about 400 (-700) µm long, with 6 periaxial cells and 6 tetrasporangia per segment, each eventually partially covered by 6 sterile cover cells. Gametophytes unknown. Known from Algoa Bay to Scottburgh in southern Kwazulu-Natal (36-50). 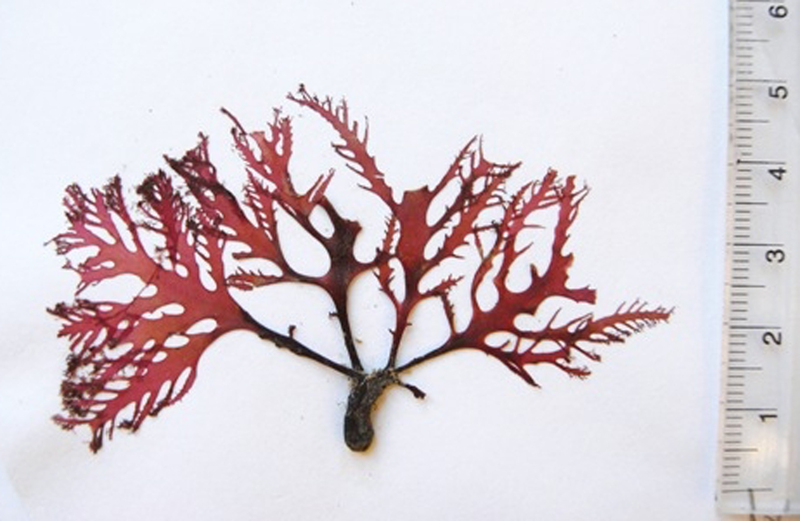 Apparently rather rare, collected mainly in drift but also known from Southern Kwazulu-Natal reefs down to 35 m depth. Note: this species was known earlier as Eupogodon pinnatifolius (Suhr) Silva, then stated by Millar (1996) to be synonymous with Mediterranean Eupogodon planus, (C.Agardh) Kützing, but described as a new genus by De Jong et al. (1997). Dipterocladia pinnatifolia, herbarium specimen from Woody Cape (BOL 16395). Dipterocladia pinnatifolia, tetrasporangial stichidia (stained slide). Dipterocladia pinnatifolia, single tetrasporangial stichidium (stained slide). 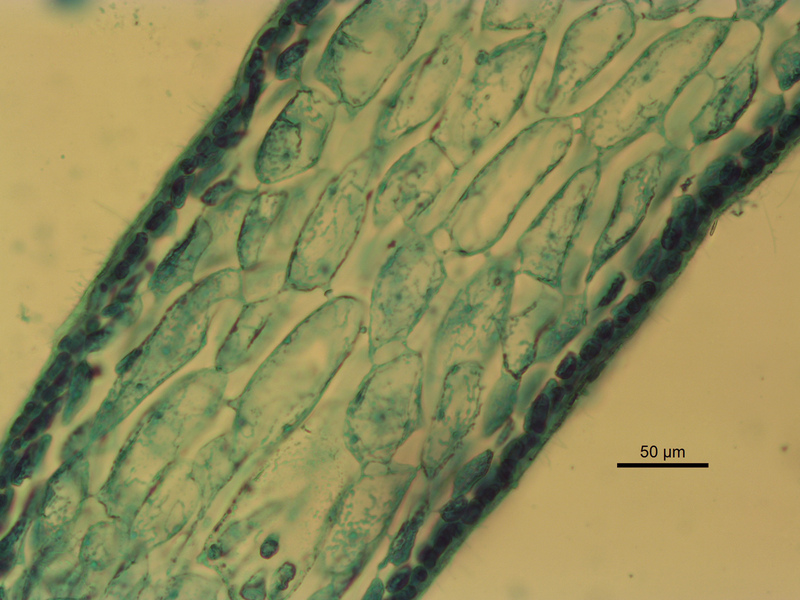 Dipterocladia pinnatifolia, cross section of thallus (stained slide). De Jong, Y.S.D.M., Prud'homme van Reine, W.F. & Lokhorst, G.M. 1997. Studies on Dasyaceae II. 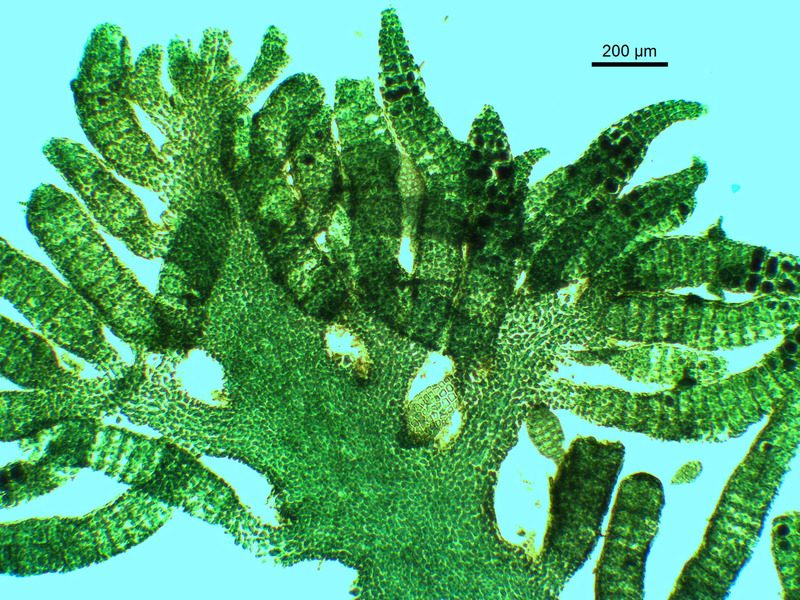 A revision of the genera Eupogodon and Dipterocladia gen. nov. (Ceramiales, Rhodophyta). Botanica Marina 40: 421-450. Millar, A.J.K. 1996. Dasya roslyniae sp. 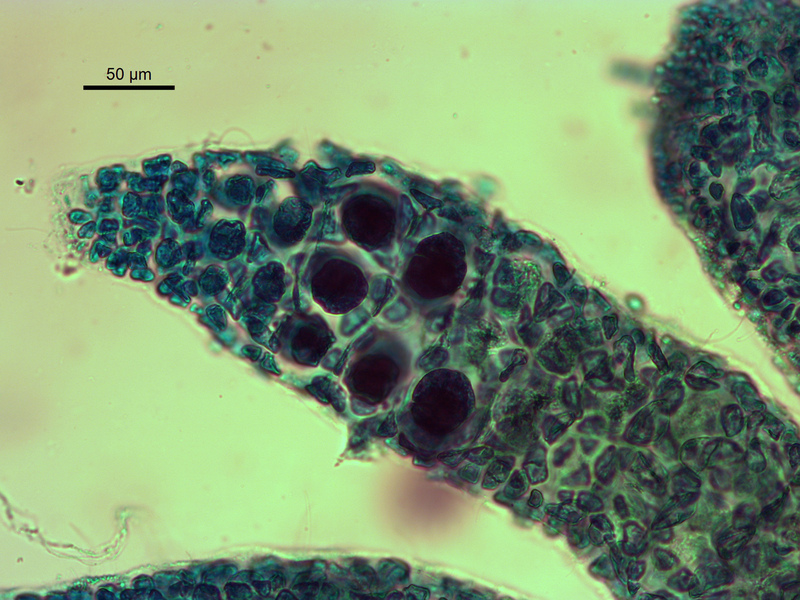 nov. (Dasyaceae, Rhodophyta),with a discussion on generic distinctions among Dasya, Eupogodon, Rhodoptilum, and Pogonophorella. Journal of Phycology, 32: 145-157.